As a young’un, I had no use for Milton Caniff. I had grown up, in the 60’s and 70’s, reading hislater-day Steve Canyon strips in my local newspaper (or, starting in 1973, the Menomonee Falls Gazette) and was completely unimpressed. It wasn’t until 1983, when Kitchen Sink Publishing started reprinting the series from it’s 1947 beginning, that I saw what all the fuss was about. Unlike the tiny (in every respect) soap operas that Caniff was writing and drawing while I was coming of age, the first 15 or 20 years of the strip was epic, grand, full of exotic locals, eccentric characters, and beautiful women who were individualized instead of all looking like the same dame with different hairdos (one of my pet peeves, which I will expand upon at a later date—be warned!) His lighting/cinematography was realistic yet simplified, and the compositions were clear-yet-dynamic. The character’s acting/ posing was… what was it? Not over the top and operatic, like the work of Neal Adams in his early 60’s Ben Casey comic series. 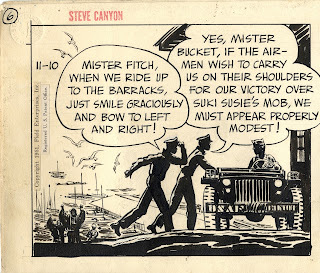 Often the characters in Steve Canyon were just standing inexpressively… yet, like everything else in these strips, there was not a wasted line, word or gesture. Everything, the compositions, the acting, the lighting, posing, inking, character designs conspired together to move the stories briskly, clearly forward. This, I saw immediately, was the work of a world-class cartoonist at the top of his game. 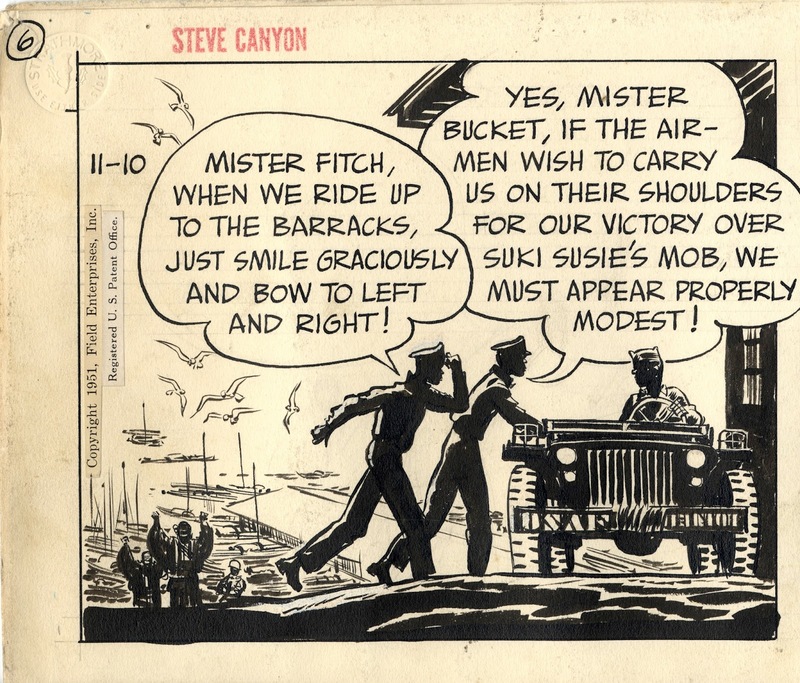 The daily under scrutiny here is Steve Canyon, by Milton Caniff, from November 10, 1951. Panel 1) Check out the cool way the men and jeep in the middle-ground are in shadow as though cast by strong daylight. In the background, cropped by the horizon of the foreground unpaved street dropping steeply downhill, we see foreign-looking figures, also in shadow, with their arms raised (is this a story element or just background texture? I’ve never read this storyline, so I have no idea) I appreciate the simplicity of the rendering; thick, juicy blacks with light areas picked out for a back-lit feeling. The dirt road in the foreground is similarly treated, giving a unified feel. The lightly sketched far-distant background, we see the military base looking out toward sea, the unseen, undrawn horizon disappearing in the haze. The word balloons, with the generously large lettering, occupy over half of the panel yet, masterfully, hide nothing of interest to the story. The panel under scrutiny here is Steve Canyon, by Milton Caniff, from November 10, 1951. Panel 2) Caniff structured his daily strips like gag strips. Each strip would usually have 3 panels; the first panel would be set up, the second would develop the action or character interaction, the 3rd would pay it off with a punch line of sorts. This daily appears to be the ending of one storyline and the beginning over another (apparently featuring Steve’s love interest and future wife, Summer Olson) so the usual set up/development/payoff structure is truncated into panels 1 & 2. The two soldiers, apparently supporting players in the previous storyline, feel themselves to be heroes for their involvement in the previous storyline and crow expectantly about their coming appropriate welcome home. The payoff, in panel 2, is that nobody knows or cares about their exploits. Notice, as with panel 1, how the lettering takes up the better part of the panel yet in no way impinges on the artwork. As for the acting, the soldiers have their hats off as if expecting a ticker-tape parade but their only audience is a grunt doing KP and the smirking jeep driver. Everyone is in the perfect pose to pay off the joke. And the inking, as in panel 1, is thick and juicy, slopped down at high speed, yet accurate and controlled. The panel under scrutiny here from Steve Canyon, by Milton Caniff, published November 10, 1951. Panel 3) Let’s say a word about establishing shots, especially those of interiors with windows exposing daylight exteriors. It is an artistic challenge, in both photography and art (if one is aspiring to a realist effect) to get enough light to see the interior space while not having the exterior be completely blanched out. 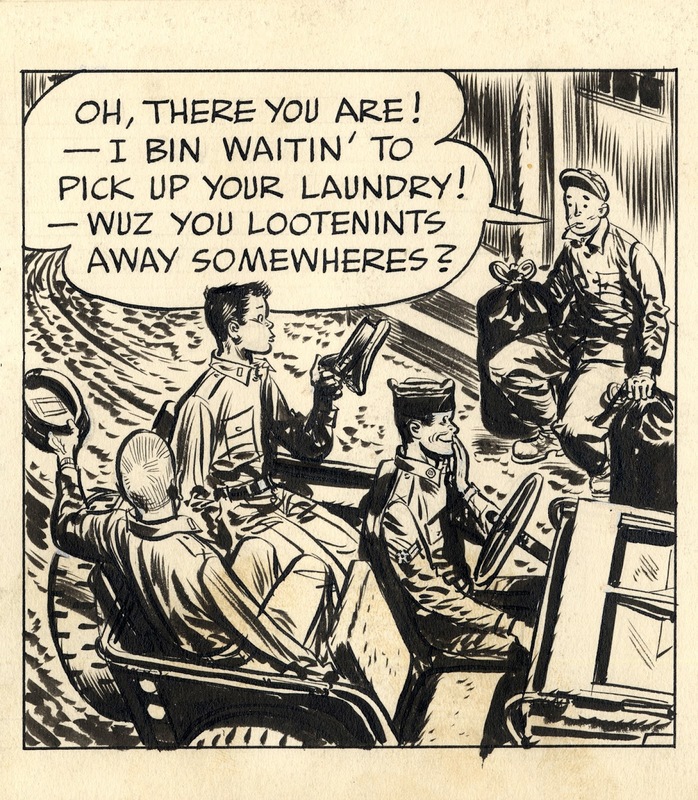 Caniff handles it masterfully here, using a technique similar to that in panel 1, i.e. keeping the foreground (laboratory interior) in black shadow with just enough light areas picked out for readability, and sketching the distant background (college campus exterior) loosely, lightly with just enough tiny lines for it to be recognizable. The black shading on the back and lower jaw of the foreground man gives the impression that both figures are lit by the panel-right window even though the middle figure is only similarly treated by the thick shadow on his left lapel. One more time I have to gush about the inking. I love the ink blotches on the middle figure’s crumpled vest and the almost signature like squiggles on his panel-right arm. There are 2 different kinds of comic book/strip inkers: those whose work suffers when seen full size (or enlarged) and those who look better, as if one is really seeing them for the first time. Caniff is one of the latter. Unlike Harvey Kurtzman who struggled to give the false impression of looseness and spontaneity, Caniff really did slap the ink down. There’s a story told by a visitor to Caniff’s studio: When asked for a piece of artwork, Caniff grabbed a brush hardened with dried-in ink, bashed the ink-dried brush end into a table to loosen it up, dipped the brush into an inkwell, and whipped out a typical Caniff drawing with this crude tool.